I’ve posted the Friday Follies so often that I’m considering making it a regular feature. Let me know your thoughts, please? I took the Tahoe in yesterday for its quarterly oil change and yearly inspection. Afterwards, I stopped at one of my favorite greasy spoons, “TJ’s”, for lunch. TJ’s is a typical working class diner. Yesterday the clientele included some elderly ladies out for a group lunch, a couple of cops from the city PD across the street, and a number of construction/maintenance/lawn care workers who’d dropped in for lunch. In other words, a typical crowd. The Kid didn’t understand why it was necessary. Grandpa said they had to do it, next year would be too late. The Kid brought up something he’d seen on MSNBC. The conversation went on like this. Kid: **mumble, mumble** MSNBC, ** mumble, mumble **. The table with the three elderly ladies cracked up. The debt limit impasse continues. Good. I’ve noticed that in all the rhetoric, the cuts being mentioned are cuts in the rate of increased spending. I sincerely hope Mitch McConnell has won his last election. He’s unfit to hold office. Boehner appears to have grown some spine. I remember his cave on the last Continuing Resolution and I said he was unfit then. That’s still my opinion but maybe, just maybe, he’s grown some spine. Contrary to the lies coming out of the WH and from Reid, a CNN poll reveal that the people of the country want a balanced budget amendment by a 3 to 1 margin. The Shuttle Atlantis returned yesterday from the International Space Station. With that return ended NASA’s manned space program. 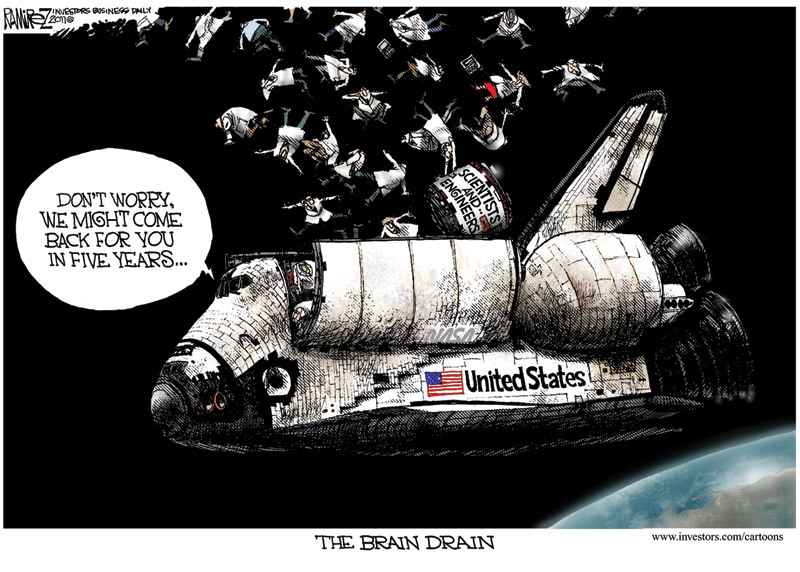 Michael Ramirez had this to say. The libs and dems continue to say that businesses are hoarding their cash. All that is needed for recovery is for them to release some of that cash and add new employees. They ignore the fact that it just isn’t that easy. With the completion of the Census, states are reviewing their Congressional district boundaries. Missouri lost a seat and our ‘Pub legislature redrew the House boundaries. Whatta ya know! Dem Russ Carnahan (D-MO-3) lost his district. His home now resides in the district currently held by Democrat Lacy Clay. Clay is black and his district includes St. Louis. Bye, bye, Carnahan! North Carolina is doing the same. In 2000, the democrat state legislature created the infamous string districts—districts that ran along Interstate Highways and other heavily black areas to insure elections of black democrats. North Carolina is doing like Missouri—merging the “safe” democrat districts. They are keeping the Gerrymandering from 2000 to block any federal interference. But the new dem/’pub ratio will be towards the ‘pubs. Ahhh, what goes around, comes around. Karma at its best. Y’all have a cool and safe weekend!